The Dolomites never cease to amaze us. If you can’t see the powerful mountain range in person, we have to imagine the next best way to experience its beauty is by drone. This aerial video by ClearSky features many of the ranges most well known locations: Seceda and Lagazuoi mountains, Cinque Torri of the Nuvolao group of mountains, the Seiser Alm Alpine meadow, and the Falzarego, Giau, and Gardena Passes. 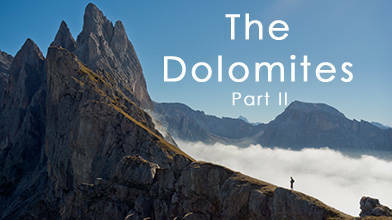 Description: This is the second part of my 5 day trip to the Dolomites. It features the famous places Seceda, Seiseralm, Cinque Torri, Lagazuoi, Passo Falzarego, Passo di Giau, Passo Gardena and many more. Let impress you from this great mountains.